The best (or worst) visual aid for your talks is you. You are the focus of attention in your presentations. Not your PowerPoint slides. In fact, many of the best speakers – politicians, comedians, TED presenters – don’t use any supplementary visuals at all, just their own face and body. They craft their message carefully and hone it through rehearsals. This preparation allows them to focus on delivering their content effectively through their body language. Non-verbal communication has three uses, according to David Lambert. It can replace speech (e.g. a wink), reinforce speech (e.g. nodding while saying ‘yes’) and give clues about our true feelings (e.g. fidgeting due to nervousness when presenting). Successful speakers use open, controlled and strong gestures that reinforce their message. Less successful speakers contradict what they say with their non-verbal behaviour. For instance, if your body language suggests nervousness when you speak, the audience will interpret that as a lack of confidence in your own message. Equally, if you fold your arms while you speak, you create an implied barrier between you and your audience. That’s why successful leaders learn how to control their posture and gestures to avoid negative or distracting body language. 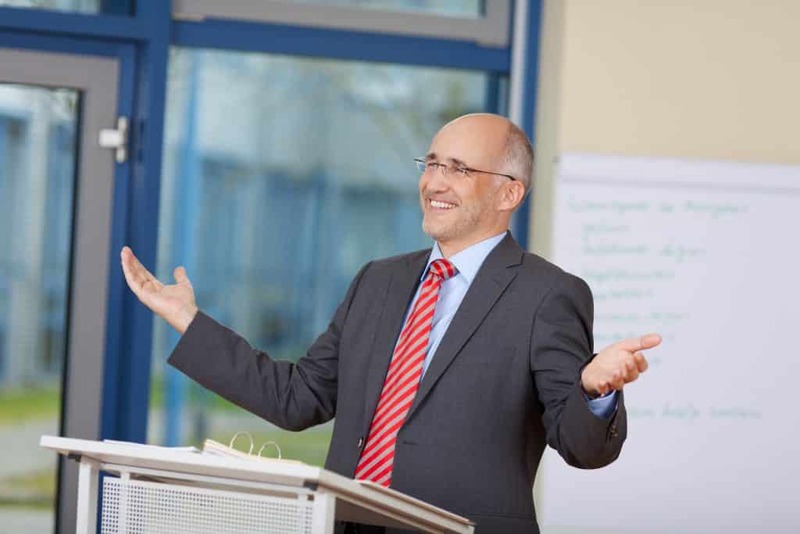 Click here to read “What should I do with my hands?” – our introduction to powerful body language for speakers. Speaking to large groups of people isn’t a natural situation, so aiming to behave ‘naturally’ is an unhelpful goal. In fact, to transfer energy and enthusiasm to your audience, you need to be ‘more’ than you would normally be in smaller-scale interactions. For example, being more expressive and more powerful in your command of space. At Benjamin Ball Associates, we film our clients during our coaching sessions. When they watch the footage, they are often surprised to see their body language contradicting their message. For example, one speaker subtly shook his head in a ‘no’ gesture’ when he was answering ‘yes’ to a question. For a low-tech alternative, try delivering your talk in front of a mirror. If your content is weak, even the best delivery will leave audiences unmoved. Conversely, the better your content, the more confident you’ll feel about delivering it. Ensure our clients have a clear message for their audience to take away. Help them break their content into key points. Work with them to find the stories and evidence to back up those points. Create a subtle structure that gently guides the speaker and their audience through from start to finish. Strengthen the language use, making word choices and phrases more powerful. Refine the start and end until they produce maximum impact. We can support you with all aspects of your talk, from your structure and messages through to your delivery and body language. Our team has helped hundreds of CEOs and senior executives to overcome their nerves and confidently deliver impressive and persuasive talks, speeches and presentations. We can transform your talk in as little as half a day. We come to your office and work 1:1 or in small groups. Call Louise on 020 7193 0130 or email louise@nullbenjaminball.com to find out more.